The DE Group are pleased to announce the opening of a new depot for its DE South business located in Basingstoke Hampshire. The business will be located on the A33 on the outskirts of Basingstoke, close to the M3. From this new location DE South will be in a position to offer a twice a day delivery service to its customers across the South of England. The new units officially opened at the beginning of June 2015, with and will be fully operational by the end of August. The opening of the new operation is another significant step forward for the Group, and will provide the platform for further business expansion throughout the region. The depot has been opened and will be run by General Manager Edwina Heffendon. Edwina has been managing the project from the initial property search, right through to the first van leaving with the first customer order at the beginning of June. 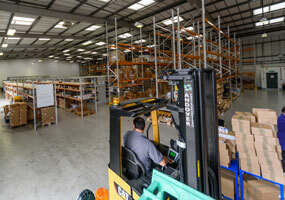 DE South, Units 5 and 6 Bilton Road, Kingsland Business Park Basingstoke,RG24 HLJ.